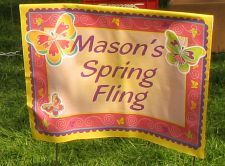 Today I visited the annual "Spring Fling" in Mason to buy a few handicrafts and to be tempted by the homemade baked goods. I happened upon a seller of leather goods and found the fanny pack pictured here. 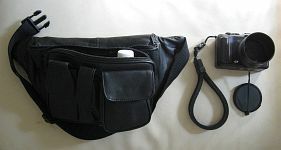 It struck me as ideal for carrying my Canon G9 camera on my photo walks, along with a small bottle of water. Later in the day I decided to walk off some of the calories from the baked goods I had sampled, so I strapped on the pack and left on a 85-minute treck. I headed north and walked through the Spring Fling again. Then I visited the Mason Skate Board Park for the first time. Being a nice Saturday afternoon with ideal weather the park was full of young men practicing their skate boarding skills. One young man approached me to discuss cameras. Then I continued on determined to visit other sites for the first time. 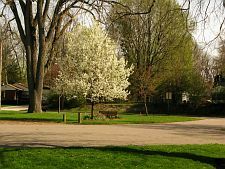 I had a nice stroll through Laylin Park on Maple Street. There were many children enjoying the day on the swings. 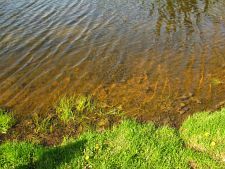 There is also a fishing pond for "Catch & Release". I finished the circuit returning home 85 minutes after leaving. I generally make it a habit to walk briskly on these walks to gain maximum exercise benefits, but of course I still enjoy the scenary as I walk and pause when something catches my attention. Sometimes I talk to people, examine some detail or frame and take photographs. This provides a great combination of improving my health through exercise and enjoying my town. 1. I've also admired this beautiful old home a couple blocks from my own home. It is always worth a look. 2. 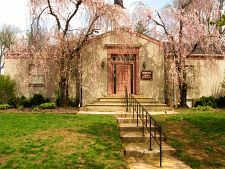 This is the Mason Historical Museum. When we first moved here about 15 years ago this was a Christian Scientist museum, but the building was converted to a museum dedicated to the history of Mason, Michigan. 3. This was our first home in Mason when we moved here about 15 years ago. After our daughter Margaret got married and had a child the house got a little crowded for two families, so we moved to a smaller house on Cherry Street and sold this house to our daughter and her husband Jeff. 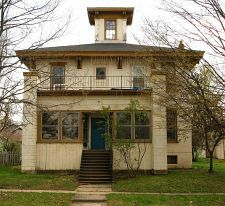 They live in this historic old house on Oak Street with their two children Tobias and Hazel. It is in the Italianette style and was build in about 1840. It was a Mason jail, a home for wayward girls, and old folks home and housed the first bank in Mason. I've met several people in the community who have lived in this house. 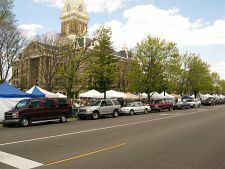 It is one block directly south of the courthouse building in the town square. 4/5/6. 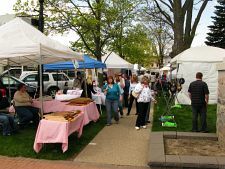 The annual Spring Fling was taking place on the town square, which contains the historic county courthouse. 7/8. The Mason Skate Park, a big attraction for the Mason youth. It was full of kids practicing skate boarding, but I didn't get an acceptable shot of them. I did get an interesting shot of the rather graphic wall. 9. I found this scene fascinating. 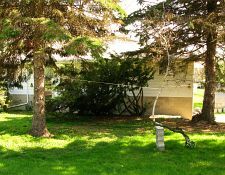 A small tree with a big curve was being supported by a stack of cement blocks with cord holding the top of the tree. I suppose they were giving the small tree support till it became strong enough to support itself in this weird shape. 10-15. 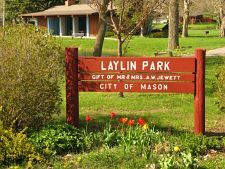 Laylin Park on Maple Street in Mason. 11. 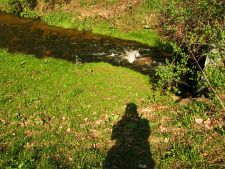 I caught my shadow (intentionally) while getting a pic of the stream running into the park.12. Here were the swings and other equipment for the children. 13. This is part of the catch&return fish pond, with the bottom in sight. 14. 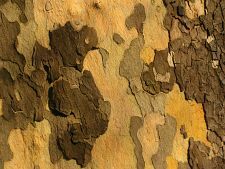 This large tree trunk shows some interesting details. 15. The park is very attractive. 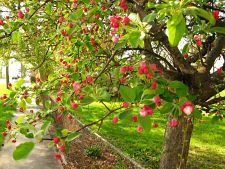 Here is a flowering tree. 16. On the way home I spotted this spectacular flowering tree. 17. I often see interesting juxtaposition of various roof lines in Mason. There is a great variety of house designs, and the houses are generally close enough together to allow this kind of view.